and connection to post disaster communities. We hold monthly interactive children‘s workshops and annual community events to unite survivors with outside energy and volunteers. FEATURING STUART-O, YU HAYAMI, TERUMASA HINO, CHARLIE OKAMURA AND SECRET SANTA SUrPRISE GUEST KONISHIKI. Santa Soul Train is part of the Place to Grow series of community workshops and events that support connection and recovery in post-disaster communities. A year-end celebration of the friendships and connections made throughout the year, and throughout the recovery. This year, we are partnering with Konishiki and his Rise Up initiative to encourage and inspire children during the holidays. Join us to help bring a bigger impact to Tohoku and Kumamoto. Watch a high-energy overview of the 2015 Santa Soul Train holiday event from a volunteer point of view, from packing presents to card-making, to celebrating and dancing. Would you like to be a Secret Santa for Children in Tohoku? How does a Secret Santa school participate? Let us know how many stockings you want to create – it could be for one child, one class, or one school. We'll send you a brief overview of the situation in Minami Sanriku, and information about the Santa Soul Train event on December 11th. Each card will be put into a stocking, with small children's gifts. We recommend one stocking/card set for each person participating, and a corresponding ¥3,000 donation for each stocking/card set. We will send you a template that provides ideas for messages that you can add to your cards in Japanese. Decorate and personalize your card to your heart's content. We'll send you a one page overview of the situation in Minami Sanriku to help them understand the current situation in Tohoku. Send your card(s) by mail directly to our Minami Sanriku Place to Grow coordination center address below by December 6th. When we receive them, our volunteers will match them to stockings before the big day, and distribute them up and down the Tohoku coast. You can also donate online / via credit card using the button below. If you pay online, we kindly request that you add on 3% to your total online donations to cover processing fees. A giving experience to be part of. Video summary of the holiday event in Minami Sanriku. Access to volunteer training and events. Donate ¥3,000 to sponsor a stocking. 2016 holiday event in Minami Sanriku. 2017 monthly community building workshops in Minami Sanriku and Kesennuma. Connection and empowerment, combating loneliness and depression. Culture exchange fostering new ideas and energy. Local community unity and cooperative spirit. Knowing that a little girl or boy somewhere will be inspired by opening their stocking on Christmas morning and reading about who you are is a great feeling. For children in post-disaster communities, it is a touching reminder that they are not alone. Part of the greater connection we achieve with Tohoku is by continuing to be there for them. Local kids from Minami Sanriku sing their hearts out. How are the stocking sponsorship donations used? For every sponsored stocking, ¥500 goes to purchase small gifts to fill the stockings. The remaining ¥2500 brings the stocking to every child in the area, along with your child(ren)’s cards, and funds the holiday event in Minami Sanriku where approximately 500 attendees from all over Tohoku gather. This includes costs like food and drink, logistics, shipping, and support for entertainers. Excess or unused funds go to the Place to Grow organization, to fund community workshops and events that support connection and recovery in post-disaster communities. Be part of giving back; you will love it. Learn about post-disaster communities, and share with your friends and colleagues the opportunity to learn what children's lives are like when recovering from a disaster. Express yourself through art and sharing. Connect with someone far away, because you can. What is the Place to Grow relationship with O.G.A. for Aid? Place to Grow started as a community connection project for the non-profit disaster relief organization O.G.A. for Aid, founded in Minami-Sanriku in Tohoku. After a successful pilot program Place to Grow was launched as an independent NGO focused on events and programs supporting connection and community growth in post-disaster communities. In past years, our school put together our own stockings with gender neutral gifts. Can we do so again this year? Yes! We would love to accept your support and will work with your school to find an appropriate way to partner. 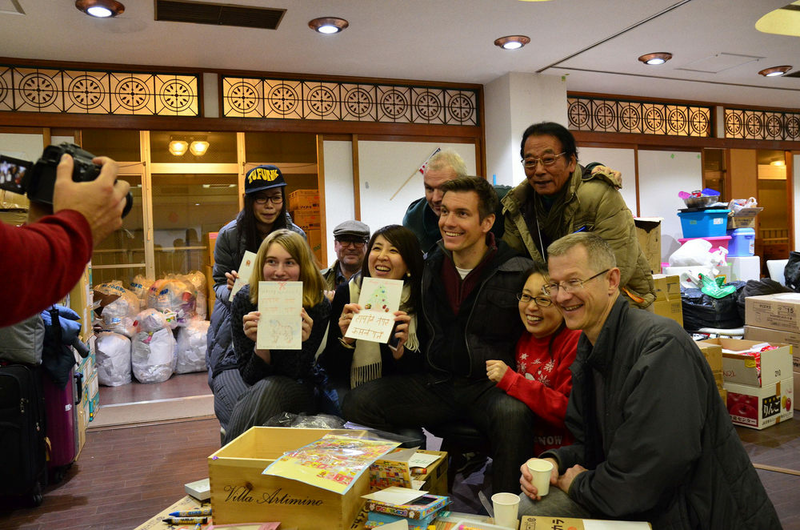 Ohana volunteers holding an art workshop in Minami Sanriku as part of the Place to Grow program. What is Place to Grow? Place to Grow is a program supporting post-disaster communities to come together through intergenerational classes that connect children, elderly and outside volunteers. Our events help survivors to keep hope and build resilience through community, connection and inspiration. 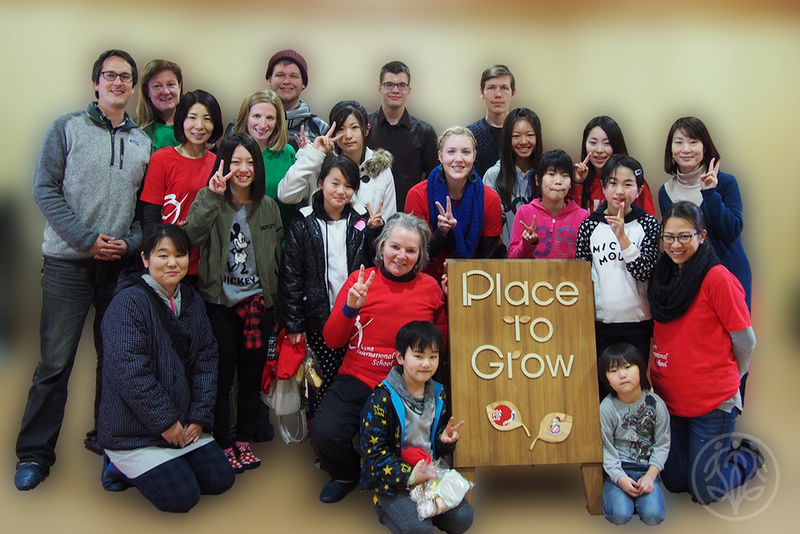 Place to Grow holds monthly workshops in post-disaster areas of Tohoku, and yearly community events that bring in visitors from all over Japan and the world. And it is all powered by dedicated individuals like yourself, who volunteer their energy, passion, and ideas together with a commitment to help survivors recover. When are the stockings delivered? Stocking gifts are given out to the children at the main event - a grand banquet held in Minami Sanriku on December 11th, and the remainder are distributed to over a thousand children in coastal Tohoku and Kumamoto that can't attend the event by our "Cycling Santas" and other delivery methods. Looking for an adventure this holiday season? Take a road trip with the Elves to Santa's Place to Grow workshop in Minami Sanriku. We still have spaces left for volunteers that want to join us in putting on the Santa Soul Train event on December 11th, 2016 in Minami Sanriku. Last year, it was an AMAZING experience. Sharing presents, working together, entertaining each other, and putting on a good old fashioned party! #1 - Pack gear, wrap presents, organize stockings, cook food, and prepare for the party. #2 - Support the children's music workshop and stocking making workshop with locals. #3 - Ride as cycling santas and deliver gifts to communities along the coast. #4 - Set-up, clean up, and wrap-up. #5 - Get down, dance, and party! Learn more about Place to Grow. | Check out last year's Santa Soul Train.